This applicator delivers up to 3.5 pounds of adhesive per hour. Key features include: 10 oz. 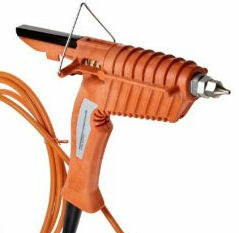 ; 150 watts; 120 VAC voltage; 385 degree F (196 degree C); and 5/8 in x 2 in cartridge size. 12 month warranty. Adhesive sold seperately. Note: Not to be used with low temperature adhesives.